U3 A1 Criteria This is the criteria/brief for unit 3 - information systems assignment 1, covering P1, P2, P3, P4, P5, M1, M2, and D1. U4_A3 Criteria This is the criteria/brief for unit 4 - impact of IT on organisations, assignment 1; covering P1, P2, M1, and D1. U8 A1 Criteria This is the criteria/brief for unit 8 - ecommerce assignment 1, including P1, P2, P3, P4, M1, M2, and D1. U4_A2 Criteria This is the criteria/brief for unit 4 - impact of IT on organisations, assignment 2; covering P3, P4, P5, and M1. U4 A1 Criteria This is the criteria/brief for unit 4 - impact of IT on organisations, assignment 1; covering P1, P2, M1, and D1. BTEC ICT LEVEL 3 UNIT 1 Communication and employability skills for IT P1,P2,P3,P4,P5,P6,P7,P8,M1,M2,M3,D1,D2 Unit 1 communication and employability skills for IT, Includes P's, M's and D's. Includes over 9,000 words in assignment. BTEC ICT - LEVEL 3 - Unit24 - ControllingSystems Unit 24 controlling systems assignment. There may be P's M's and/or D's missing in this assignment. BTEC - LEVEL 3 - Unit 10 Communication Technologies BTEC LEVEL 3 UNIT 10 Communication Technologies P1,P2,P3,P4,P5,P6,M1,M2,M3,D1,D2 Contains over 9,000 words. BTEC LEVEL 3 Unit 2 Computer systems Computer systems P1,P2,P3,P4,P5,P6,M1,M2,M3,D1,D2 Completed. BTEC LEVEL 3 UNIT 5 Managing Networks BTEC LEVEL 3 Unit 5 Managing networks P1,P2,P3,P4,P5,P6,M1,M2,M3,D1,D2 Includes over 6,000 words. 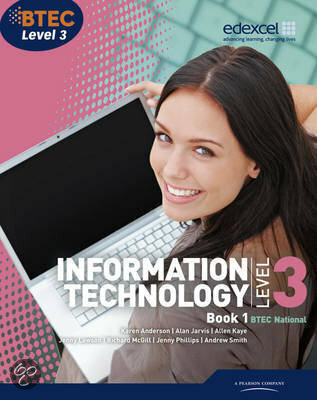 On this page you find summaries, notes, study guides and many more for the study book BTEC Level 3 National IT Student Book 1, written by Karen Anderson & Alan Jarvis. The summaries are written by students themselves, which gives you the best possible insight into what is important to study about this book. Subjects like criteria, m1, p4, d1, m2, p1, p2 & p3 will be dealt with.